What are your wishes regarding your final days? When Terry Schiavo's story hit the news, many people were speaking out for both sides of euthanasia; both the pros and cons, passive and active. The phrase "persistent vegetative state" became a household term and many people were urged to consider the benefit of having a living will. For that reason, More Than Meets the Eye contains a legal copy of a Living Will, or you may download it from the link below. Don't let others decide for you; state your wishes now. You may DOWNLOAD YOUR LIVING WILL HERE, and then print it and sign with two witnesses to legally secure your desires concerning life-sustaining treatment and end-of-life procedures. You are not alone! Yvonne's compassionate views about euthanasia come from her first-hand experience when her uncle was kept alive by machines for almost a year while his doctors allowed his wife to cling to false hope about his ability to survive. His doctors knew he was dying, but would not take action to free him from his suffering. Her uncle's spirit came to her while he was in coma asking her to help his wife understand that he wanted to be released from his body despite what his living will stated. What a relief it was for her and her uncle when his body was unplugged from life support and his spirit was finally freed to soar. Doctors are not typically trained in medical school to deal with the spiritual side of dying and therefore many of them do not have the ability to address end-of-life decisions with families. Many have no idea how to comfort or prepare a patient or his/her family when the soul is transitioning to the Afterlife. More Than Meets the Eye includes a commentary by Dr. Aaron Milstone, Director for the Lung Transplant Department of Vanderbilt University Medical Center, to bring comforting light to issues such as euthanasia, end of life decisions and other topics we don't normally talk openly about. Dr. Milstone's unique and intuitive method of helping families cope with the impending death of their loved one is shared in this book and will be of great assistance to any doctor or hospice care worker who deals with a high patient mortality rate. Many families face similar situations, and this book can be a tremendous encouragement to them. How can anyone know what the Afterlife holds? Psychic ability is an advanced state of spiritual awareness, and many people are acknowledging and developing their ability to tune in to higher vibratory realms and communicate with those on the other side. Channeling through mediums and psychics has become an acceptable method of gaining spiritual information. Additionally, thanks to modern medical equipment, those who have been pronounced clinically dead have been resurrected to tell us what they experienced on the Other Side. 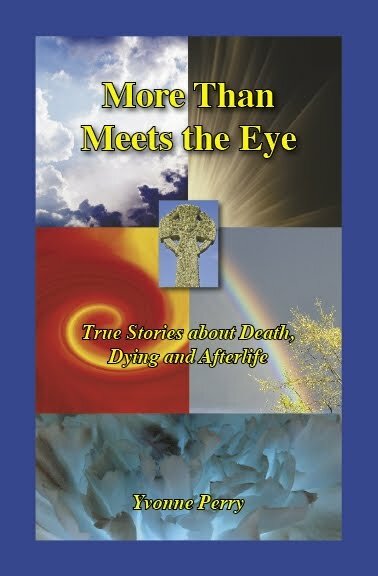 More Than Meets the Eye records several of these near-death experiences including her own, but the account given by Rev. Juliet Nightingale tops them all. She has died and come back to the same body three times! Rev. Juliet Nightingale is the International Relations Coordinator for IANDS (International Association of Near-Death Studies) and former director to the Friends of IANDS Nashville - a discussion/support group for those who have had near-death, out-of-body or spiritually transforming experiences. Perry has done a splendid job in bringing forth vital and pertinent information covering all facets of death, dying and the Afterlife—a subject that must be faced squarely in order to release us from the illusions and fear that have plagued us throughout human history. Are People Who Commit Suicide Punished in the Afterlife? Coping with the death of a loved one is saddening enough, but the grief associated with death by suicide is often compounded by shock, guilt and confusion. The stigma associated with suicide may cause people to fear that their loved one may be punished in the afterlife, but this is not true. One reader reported that her son, who had committed suicide, came to her in a dream after she read More Than Meets the Eye. He was not being punished for ending his life; instead he was preparing to reincarnate in order to finish the mission he had aborted. You are so brave to have written this book, but I'm so glad you did. I cannot begin to express the healing power it gave me to go on after the suicide of my son. I've sent the book to my father who is still grieving for the son he lost almost three years ago. Cheers to you, Yvonne. Earthly life presents many challenges that allow us to grow spiritually, but there are those who become so disillusioned with the process that they feel they no longer want to live. When someone feels suicidal, they have allowed the ego and negative aspects of life to cloud the true aspect of who they are. The ego can make us feel ugly, unworthy, unappreciated, unlovable, unkind and undeserving. By controlling the ego through the higher aspect of the mind, we are more able to face and conquer life's challenges. When we consistently remember that we a spirit being having a human experience, we can bring about desired changes in life's situations. Suicide is never the best option for escaping the drama of painful or unpleasant situations one has experienced in life. Ending a life via suicide will not put an end to the emotional pain because emotions continue in the Afterlife. While the soul does NOT have to endure hardship in order to learn its lessons, these experiences are sometimes created by the soul to help it evolve. We can learn to evolve in more positive and gentler ways. If we "skip class" and depart prematurely by our own devises, we will still need to learn the intended lessons in another lifetime. Understanding that you have the power to create your life as you want it, and taking steps toward making positive changes will allow you to enjoy life on earth and then go peacefully into the Afterlife once your mission here is complete. Through this book, you will begin to see yourself as an empowered spirit being with a purpose on earth. The author hopes that the encouragement you find here will allow you to continue your journey while peacefully perfecting the virtues you came here to improve. I read an article about scientist trying to prove whether or not near-death experience (NDE) and out-of-body (OBE) experiences are real. They are putting photos on the tops of light fixtures near the ceiling and then asking the patient what they saw while out of body. I just thought I would warn you in case you have a NDE or OBE so you will pay attention to the photos. Otherwise, science will not believe you! LOL! My question is: what if someone doesn’t “go” that high to the ceiling or doesn’t pay any attention to the photos since their concern is on getting back into their body or moving toward the light. It doesn’t mean they didn’t have an NDE or OBE. This is definitely not going to prove anything. Do Our Loved Ones Communicate With Us From the Other Side? Yes, spirit communication with someone who has passed is not only possible, it is very likely that you will have some type of visitation from your deceased loved one, especially in the first few months. Have you noticed a bird that seems to be trying to get your attention? Have you been hearing the deceased person's favorite song over and over? Are you having dreams about the person that seem "too" real to just be a dream? If you have lost someone you love, you can be assured that they are near you and want to communicate with you, if you will allow it. Communicating with deceased loved ones is much easier and more common than you might think. This book will show you how to tune in and teach you what to watch for. More and more people are beginning to talk about their experiences and as a result, this book is enhanced with true stories about those who have communicated with the spirits of deceased loved ones. These visitors always have a message--many simply want their family to know that they are alive and doing well, and that it is okay to move on without them. Some souls report that they have missions to accomplish in the Afterlife. A delightful exploration into the unknown by an author who openly shares her soul. If you have any doubts, fears or concerns about the dying process or the existence of an afterlife, this book is for you. A welcome blend of intrigue, courage and adventure, that will open your mind, calm your spirit and lighten your heart.